You can think about that…and draw your own conclusions!!! The recipe then held the typical ingredients of tuna, boiled eggs, fresh green beans, sliced tomatoes, anchovies and olives, but also noted optionally you might add chopped yellow onion, green pepper rings, pimento strips or canned artichokes. My pages are stuck together with vinaigrette splatters from 1978 when no one else I knew was making vinaigrette. I’m sure there were people somewhere splashing around in hard-to-find olive oil, but I didn’t know them. I had not been to Europe yet and didn’t even know the best places for olive oil production. Didn’t have Olio Santo back then. Not at my house anyway! In America, well, the United States, anyway, most salad dressing, at that time, came in bottles or from paper packets that were mixed with oil, vinegar and water in your own pre-marked bottles. My own mother made some dressings as I was growing up, but “oil and vinegar” or dressed-up mayonnaise was more likely. Vinegar alone was also one of her trademarks, particularly for sliced cucumbers with onions and green peppers. My sister would come to visit after I married and I can see her out on my back deck under a huge tree that shaded the table. She adored (still does) tuna and was enamored of Tuna Nicoise, made with canned tuna because, frankly, in the Washington, D.C. area where we were stationed, fresh tuna was unheard of. ( And, to be fair, I’ve had the dish in Nice a couple of years ago now (with said sister, even) and it was served with canned fish. ) Perhaps fresh tuna was unheard of for my budget and in my neighborhood, but really I never saw any that I can remember. The salad became a topic of conversation for her; it popped up again and again as years went by and I moved to 23 other places, “Remember that Nicoise you made in Virginia?” If I called her right now, she might make reference to it were the occasion to arise for a discussion of cooking, tuna, great summer salads, etc. My husband was fascinated by both the name and the dish. Speaking some French when I had only Spanish, he liked to lord the language over me once in a while, or use it at very opportune moments (it worked). So he liked saying the name “Nicoise” and he certainly liked eating it. It became our quintessential summer meal when tomatoes were at their best and it was just too hot to cook. Did either of us really put together why it was “Nicoise?” I don’t know. I knew I couldn’t find Nicoise olives (still hard to find; they keep most of them for themselves) and probably used black olives. Kalamatas weren’t a mainstay on the shelf then either. Dave’s great grilled garlic toast; those Texans would have given anything for it. In Nice, on our most recent trip, we arrived one hot noon at a family-style table in a tiny, but exhaustedly busy restaurant at the top of a hill. We sat, at a large table for this place and, of course shared it with another group. It was that or wait an hour. Our tablemates were a fine family from Texas: petite Mom, tall and big Dad with their two strapping (football player?) sons. Pitchers of wine on the table confused them; they wanted iced tea. Well, there was none, of course. Even water, when asked for, arrived barely chilled and in small bottles at that. No ugly Americans here, they merely pressed their lips together tightly and squinted a bit over how little there was to drink, but gamely tried the cool wine. Mom smiled; the trip was her idea of a 25th wedding anniversary gift. When Salade Nicoise (exquisitely prepared and presented, though in small portions on sweet eight-inch plates) appeared, their eyes grew large and soon after the brows furrowed. Was this all there was for lunch? You’ve got to be kidding. (Nothing mentioned out loud.) The men did their best to balance themselves on the tiny, wooden café chairs and ploughed through the Nicoise in, oh, two minutes. More bread, maybe? Butter??? How hungry they were; how hungry they were to remain. Or so they thought. Once the salad plates were removed (I was full! ), the family began to get up to leave. (Maybe there’s ice cream somewhere?) At that moment, the waitress arrived with huge platters of roasted chicken, buttered new potatoes and piles of sautéed carrots cut on the bias in large chunks. Nicoise can be a delicious first course in that part of France and so it was there. Gingerly, but with great anticipation, they sat back down, remembering the too-small chairs, to eat a “real” meal. Now this was more like it; we knew the French knew how to cook. Oh, for goodness sake, that was just the SALAD!!! Soon, big pitchers of RED wine appeared, and as it flowed and more chicken arrived, the wrinkled brows turned to huge, toothy smiles and nodding heads. Yes, this was why we came all this way. Well, Mom, perhaps you were right after all. Except for the sweet tea that should have accompanied this meal. 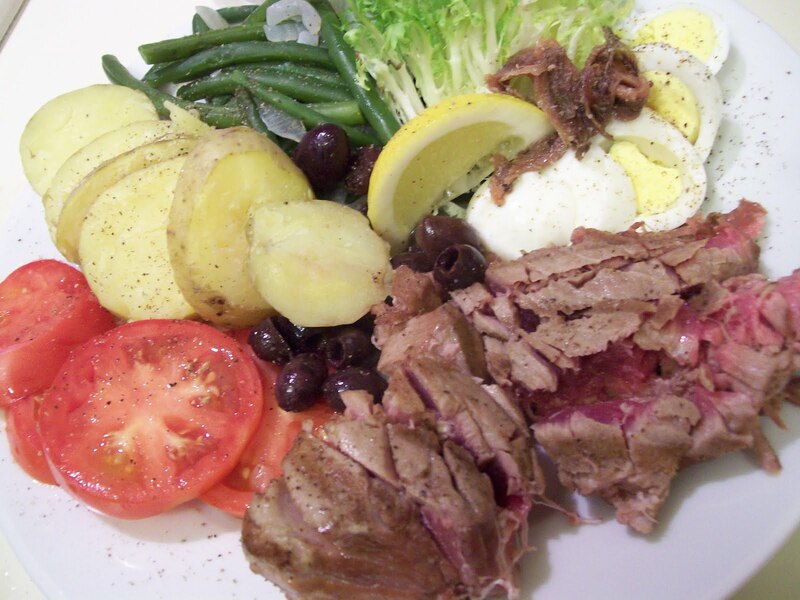 Of course, for me, to have Salad Nicoise in Nice was all I needed to complete my cooking life!!! I was in heaven, though I, too tucked into the roasted chicken, fragrant with tarragon and basted in wine and butter. My sister thought my Nicoise was better and, while it was the memory that was better truly, she made me feel like a famous chef. She has done that my whole life….and continues to do so. Here’s my current version, made recently to celebrate the last gasp of summer, eaten outdoors in the dark. (Grilled in the dark by my darling man.) This week held snow and freezing 40 degree temps here, but last weekend was lovely for cooking outdoors. Life has moved on; fresh Ahi Tuna is now available ($21.99 a pound) and I splurged. If you are unmotivated to spend $21.99 a pound for anything, think how many times you’ve paid more than that for a mediocre restaurant meal and then head for the fishmonger or butcher. Grilling the tuna: Oil and salt/pepper the tuna. Grill over medium heat about 3 minutes per side until pink at center. Cook more or less according to your liking, but don’t overcook the tuna so it looks like pork tenderloin. If you like the ultimate rare ahi, go for it. This is the place! To serve the salad, on each plate place separately (and artfully!) tomato, potato, olives, green beans, boiled egg, anchovies and some greens as tuna is grilled. When the tuna is done, add it to the plate. Squeeze lemon over all and salt and pepper entire plate. Drizzle with dressing and pass extra dressing at table if needed. Wine: Sancerre is my favorite. Any French white would suffice. Dessert: Rocky Ford cantaloupe, what else? Colorado has a few claims to fame food-wise (Lamb comes to mind, though we export most of it. ), and this cantaloupe is divine. Add chopped proscuitto if you must. Mint is better. Family Last Weekend–Great Grilling Weather! We awoke yesterday to 40 degree temps, cold rain on the mesa and snow in the mountains… One day left to “fall,” but winter had given us a draft of the final memo. Herb pots were rapidly ushered into the south dining room window and house plants, happy outdoors since June (well, sometimes), returned to their spots on top of the cabinets and hanging in the mudroom. Pansies, stoic and strong (“I can do this!”) stayed outside on the table and the geraniums in big planters just took their chances. It was also the first day of our daughter’s life in real seminary at Princeton after a preliminary, but exquisitely difficult, summer Greek course. We were anxious to hear about things like “New Testament Exegesis,” which sounds perhaps just as complicated as it is. Interpretation from the original language is how she puts it. Having no Greek or Hebrew, we’ll have to rely on what she tells us. I often read the Bible in multiple translations (all English, with occasional Spanish) at once because it helps me to think about understanding things a bit better; I’ll leave the rest to her! Occasionally, over the years of academia away from home, she will ask, “What’s for dinner?” just as if she were still here. I had no time this call for an explanation of a new pasta dish I had made, but I have it here for you! 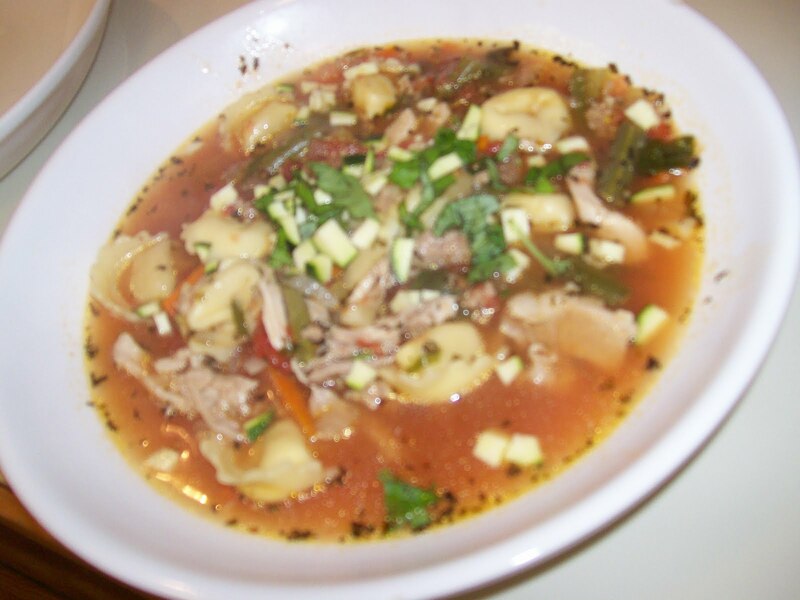 It’s almost the end of September Staples around here, but I was just using up the rest of the frozen chicken thighs from Hutson’s Tortellini Soup. Of course, if you buy most meats in huge packages and divvy them up yourself, you’ll save a bit of cash. Same thing with these thighs; I buy them in large quantities and package them in freezer bags of four or six. 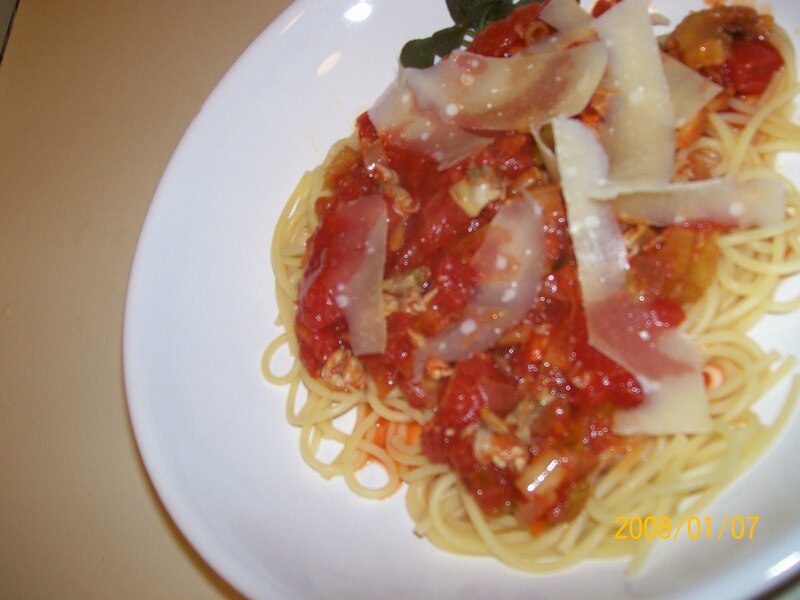 The day I made this pasta, I had no time to shop at all and simply walked into the kitchen grabbing what vegetables were available that I thought might hit it off with the unthawing thighs. I almost always have squash of several types for risotto or quick omelets, so I grabbed some of those and began to think. Before I knew it, I had a pot of water boiling for pasta, knowing that if I had the time limit of the water coming to a boil and the pasta cooking, we would eat in a half an hour. As we had a dvd of an old movie to watch, time was of the essence. About once every other week or so, we set up dinner on trays and watch a movie. Too relaxing! First the veg, then the meat… I didn’t want the meat chewy. In large sauté skillet, heat 1 tablespoon oil and red pepper flakes over medium heat for 1 minute. Add onion and squashes. Cook until softened and add garlic and salted and peppered sliced chicken thighs. When thighs are whitened around edges, add wine, lemon juice and butter. Cook, stirring gently, until chicken is barely done. Add tomatoes and barely stir. Turn off heat. Add pasta to bowls and top with chicken, vegetables and sauce. Grate romano on top and serve while quite hot. I also topped the pasta with a teense of leftover marinara and fresh basil I had leftover from Eggplant Parmesan hoagies. Si place (do as you like.) Refrigerate leftovers and reheat at half-power in microwave. Reheats well! Wine: We used a lovely off-dry Riesling to offset the heat of the red pepper. Who do you know that loves pasta? September Staples includes using up the frozen meat. It appeared there were two huge briskets, short ribs, a standing beef roast and some boxes of Omaha steak hamburgers, which are my emergency rations for any occasion. Sounded like time for a party to make barbequed brisket (coming to your food blog soon), but, in the meantime, the two small packs of on-sale short ribs caught my eye and out they came. I love short ribs and they have been sort of a trendy entrée for a while, but I also find them 1. full of fat and 2. pricey, pricey. When they’re on the cheap, I’ll grab some, try and cut out some of the fat (useless—just figure on pot roast calories that day) and fix them braised in beer or wine with onions, served over sticky rice with a plate of garlicky green beans on the side. Great for a winter crock pot when you’re busy all day. It wasn’t winter, but it had cooled off enough to want something more substantial than fish and salad. (We did eat outdoors in the “cool, cool, cool of the evening.”) And who doesn’t love a reason to raid the wine cellar of some cookable AND drinkable red wine? 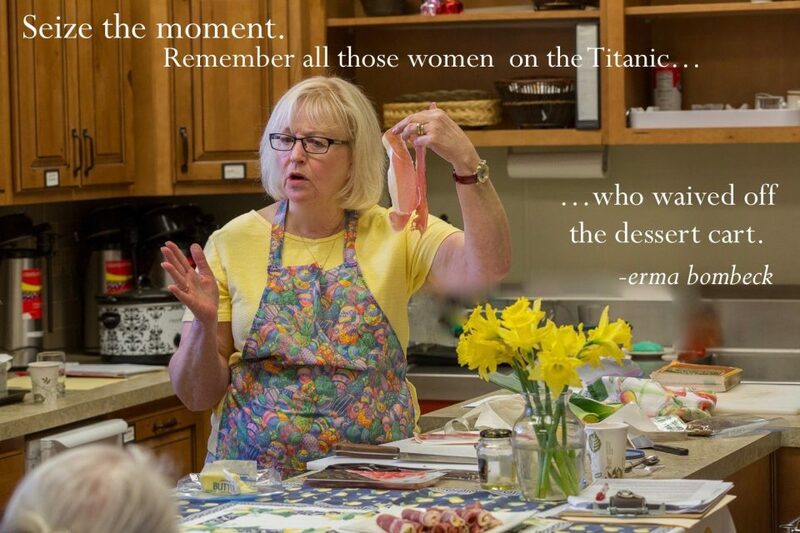 I also cook for therapy and to keep busy sometimes; cooking is good for that and baking is even better. The day I went to cook the ribs, I had a pretty rough morning personally and it threatened to knock me low; I needed to cook to free my mind and heart to consider new endeavors. (Blessings abound; the next day I saw “Julie and Julia” and saw further possibilities in life.) Cooking is so…..
Let’s do something I don’t usually do with these ribs…. I went over all of the ways I’ve made them. My friend Rick loves them any-old way and I think I’d made them for our wine group a time or two just simmered all day long with lots of broth, wine and garlic. Those were boneless ones, even more expensive and, frankly, while yummy, none of them had a lot of meat for the bang. I used them for starters and kept some behind in case someone at the dinner party didn’t like fish, the main course. What else? I got to thinking about my Dad and his cooking style. My Dad was from near New Orleans, and, hence, cooked a lot of things with onions, celery and green peppers. In those days, I didn’t see yellow or red peppers; where were they? I grew up with produce grown in my own back 40; those are the vegetables I know best. The red peppers we grew were hot enough to make a child very ill indeed; I stayed well clear of them. Lord, Lord, Lord. Just to think of them makes my mouth burn. But the pepper thing came back to me; I had plenty of peppers in the frig drawer as they had been ten for ten dollars. (My father would have called that highway robbery, but I call it a good deal in a world where fast food hamburgers are usually cheaper than fresh peppers.) At this time of year, my Mom would make pans full of stuffed green peppers, freezing them for wonderful cold winter nights. Why not throw these peppers on top of the ribs and see what happened? You could make this in the crock pot: follow through Stir Well and put in crock pot. Cook on low about 6 hours. 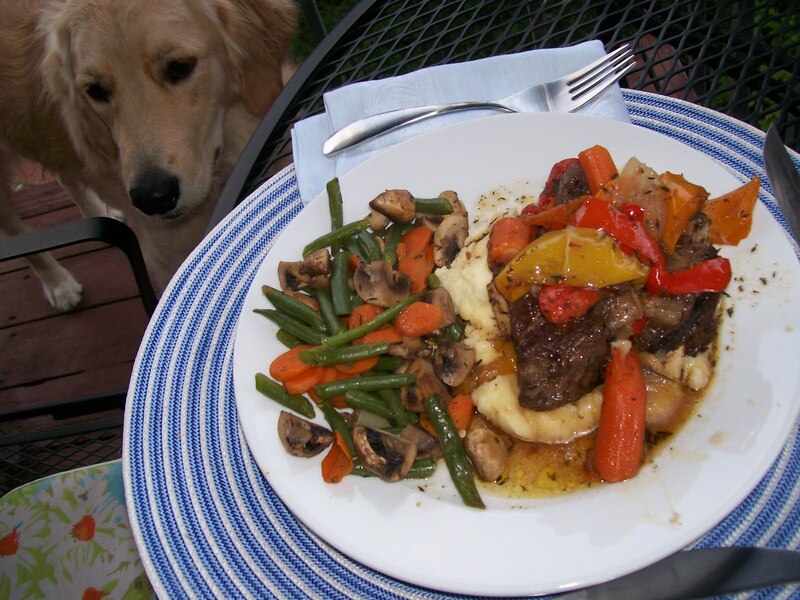 Accompaniments: I served this with the juices over mashed potatoes along side a medley of green beans, carrots and mushrooms seasoned with a little more thyme. French bread for sopping juices. Green Beans were $1.00 per pound…………Mushrooms were $3.50 per pound………… ???????? Current Reading: Barbara Brown Taylor’s THE PREACHING LIFE and Dorothy Sayers’ THE NINE TAILORS. I thought I had read everything Dorothy Sayers had written and was heartened and hopeful to find this old mystery involving church bells (one of my favorite subjects) that was written in 1934. My parents weren’t even married until ’36! Excellent, excellent reads. Current Listening: I invested in some “old” Mo-town cds a couple of weeks ago and I’m still listening. Also have on albums from The Rose Ensemble, a vocal arts ensemble out of Minneapolis. I’ve heard some lovely music from my students this week; people making music together. Chopin, Bach, Morgan…It’s all good! The other day, I finally began trying out this soup with the idea of feeding some friends who recently had a new baby. On the same day, one of my students was coming to lunch and, as anyone would, I, of course, decided to make one meal for both occasions with enough left over for our own supper. Once upon a time, there was a book called, SIMPLE PICTURES ARE BEST. That title became a phrase in our house and continues to this day, along with “You will like them, you will see; you will like them in a tree” or whatever variation thereof needs to be stated that day. You fill in your blanks on that one. Surely this was the simple way to feed folks for three meals. One big pot, some homemade rolls and oatmeal chocolate chip cookies (see May blogs.) Right. It ended up taking nearly seven hours to complete not one version, but, naturally two because of my inability to plan my time correctly. Well, I did take time out (while another batch of bread dough was rising) to have a two-hour lunch with my student friend. Joys of working at home. Thanksgiving for friends, weather, money for food………….. Since I had until 12:30 to get the first round done, I thought I had plenty of time to drink coffee, watch the news, read the paper, wash my hair and so on. What was I thinking? Naturally, I had only half of the ingredients (not knowing for sure the day before if I was or was not cooking for everyone) and had to go to the grocery store. I didn’t return until 10am when I began making homemade chicken stock………………. Definitely could make a quick version of my stock and have the soup (whose recipe was as yet unknown) done by 12:30. Sure I could! Getting a 16qt pot full of water, chicken and vegetables to boil at sea level is one thing; getting it to boil at altitude is another. Half hour later, it’s not yet boiling and I’m getting nervous. I come to the conclusion that if this soup is to be ready for lunch, I’m going to have to make it a very different way and it had better be pretty fast now. Chop onions, garlic, celery ; brown with sausage. Drain fat. Add boxed stock……..Find fresh herbs. Run to deck; run back. Chop other veg; taste……….. (not bad) What else should go in here? And so on. The soup barely got done and the pasta was very al dente when my friend walked in the door. Still, the deck table was set; there was sunshine. A pitcher of iced green tea with mint from the side garden was set out on the table. First batch of rolls was out of the oven. Lunch! No dessert yet, but prayers were answered, she arrived with perfectly ripened strawberries (needing nothing). Leave it to a gardener. She adored the soup, boxed stock and all. Note here: I used partly totally unsalted boxed stock, now available. Season to your own taste! Second note: the cheapest boxed broth in town is at Whole Foods..their store brand. (Cheapest oj, too) Odd little note, but good! After my friend left (what is there about two women at lunch and how much they can talk…now that I think about it, there’s even a song about “Here’s to the Ladies Who Lunch,” but I’m SURE we’re not like that.) I had to figure out the second soup, clean up after the first, make the cookies, roll out and bake the next batch of rolls……….. I couldn’t believe I had been so stupid that I not only had to cook twice, I had to clean up twice. Obvious not a trained chef. Onward and upward……….. I strained the big pot of real stock, shredded chicken (no deboning; it fell off), pureed all of the long-cooked vegetables and put them back in the mix, set the stock back on the burner to reduce and intensify the flavors and went to work on the next batch of whole wheat rolls (another blog). To force the second rise, I threw them in an oven I had preheated to 200 and then turned off. Next: cookies. By the time they were done, it was absolutely barely enough time to get the soup for the new baby family done. (I ended up being 20 minutes late.) I chopped all of the same vegetables again and once more threw them into a stockpot. Deja vu. At 4:45 (dinner due at 5 at their house), the pasta was going in along with the green beans. The green beans, and they can be famous for this, WOULD NOT get done. I think I packed it all up with them still kinda crunchy. Soup, bread, cookies, ah, yes, wine, too. Made it—-well, made it late, anyway. Still, they got their dinner (enough for 3 days maybe) and my husband took me out for a drink downtown to breathe for a half an hour. Later, we heated up the leftovers from the lunch version and were, I’ll tell you, pretty glad to get it. My husband said, “I could eat this every day!” (Main fan) I haven’t heard yet from the baby family, so don’t know if that batch was edible. Still, I’m guessing they’re ok as I haven’t heard otherwise. Here’s a version of the recipe using whatever stock or broth you have. Needless to write a recipe for homemade stock; google Ina Garten’s chicken stock or some such thing! The big difference between most stock recipes and mine is that, if it’s a rustic sort of soup, I puree and put back in the vegetables that have cooked in the stock. I also like to let it sit overnight and remove the fat that has hardened at the top; I think it’s easier than defatting it any other way. In large stockpot, brown Italian sausage and break up with wooden spoon. After about half-browned, add onions and celery. Cook until vegetables are soft and sausage is done. Drain off almost all of the fat. Add garlic and parsley Pour in stock and bring to a boil. Add chicken thighs, herbs, carrots, parsnips and salt, pepper and hot sauce. When thighs are done, remove and shred with forks or cut up with a knife and return meat to pot Add tortellini and fresh spinach. Cook 8-12 minutes, according to package directions, until tortellini are almost tender. Turn off heat. Taste and adjust seasonings. Wine: I like a nice California zinfandel with this, but a light chianti might suffice! 1. Heat already-cooked meatballs or sausage intead of using raw meat. 2. Sub a bag of frozen veg for fresh. 3. Sub a can of onion soup for onions and celery. 4. Sub prepared pesto for fresh basil. 5. Sub jarred garlic for fresh. Something tells me you haven’t recently dreamed about creating a chicken eggplant salad and, I have to tell you, I haven’t either. ‘Til the other day, that is. I had in mind a Greek salad of some sort because I thought I had cucumbers, tomatoes, peppers, etc and figured I’d throw in the aging eggplant sitting in my frig. Best laid plans. Also known as Alyce plans; God laughs. There was no cucumber and it was nigh on to dinner time. There were boneless chicken thighs and leftover tapenade. What to do? 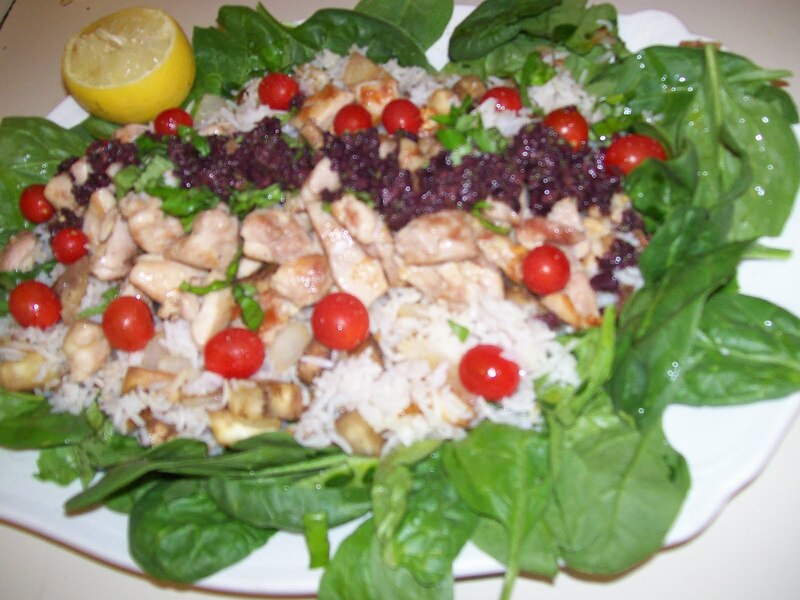 The idea for a warm salad began to come together and the idea of including spinach and rice moved in. The bare bones beginning of fall is starting in the Front Range. “The air smells differently,” said my come to lunch piano student (also a professional gardener.) A few trees here and there have some turned leaves and the day doesn’t hold the heat long any more. Plants still growing look tired, “Am I still here; isn’t it time to do something else yet?” Rain, wind. Autumn wreaths are beginning to appear on the doors and fences in the neighborhood. So while salad is still sounding yummy, warm rice and chicken sound just as good. How to combine them? What else is in the frig? This is, after all, September Staples and time to clean out and prepare for the “year” ahead as summer wanes. Ok, already saw tapenade and, while there’s no basil in the frig, there’s basil in the pot on the deck, still growing despite the cool wind. Onions and garlic on the counter: always good with eggplant. Start the rice first; it takes longest. You can figure the rest out as you go. Then, out comes a saute pan; out comes another. This will be done more quickly with two. Get the onions and garlic going; add the eggplant. Chop the thighs, brown them nicely. The dish is starting to form a picture for eyes and tastebuds. Get out a great big platter… always a good idea for something attractive. Line it with spinach. And so on. Here’s the recipe, written after the dish was not only on the table, but nearly eaten whole by two very hungry people. While it appears complicated, it came together in twenty-five minutes while the rice cooked. Rocket Man loves the kitchen. Are all dogs like this? He doesn’t mind the mess of a galley. In 2 qt covered pot, bring 2 cups water and 1 c rice to boil; season well with salt and pepper. Reduce heat and cook until almost tender. At 6,500 feet, this would be 25 minutes or a tad more. Probably 20 minutes for the rest of you. When rice is nearly tender, add 2T chopped basil and set aside, covered. While rice cooks, saute onion in 2T olive oil for five minutes; add eggplant. Cook until both are gently soft, about 10 minutes more. Add 1 clove garlic and salt and pepper well. 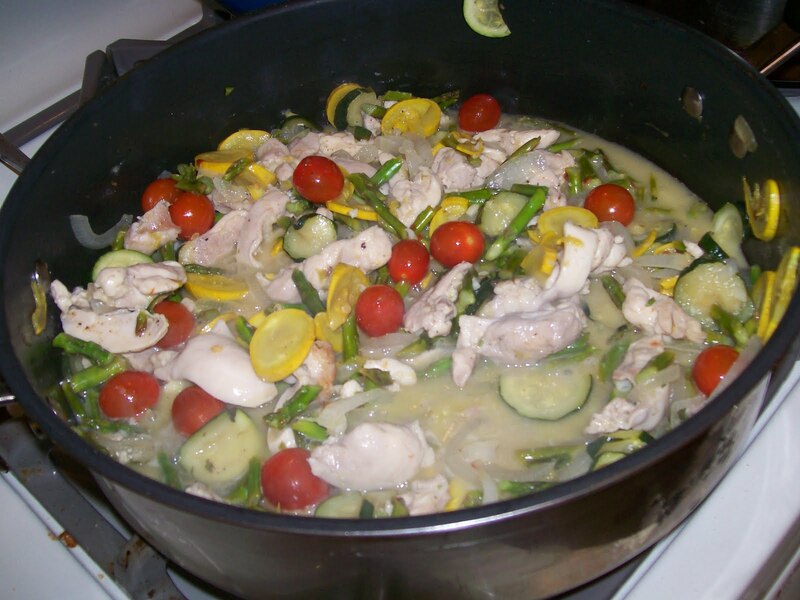 After vegetables are cooking up, heat another skillet with 2T olive oil and add chopped chicken thighs. Salt and pepper them well. Cook about 10 minutes, stirring often, adding another garlic clove after initial browning. When nicely browned and cooked through, remove from heat. Scatter spinach around edge of large platter (14″ or more). Mound rice in center. On top of rice, spoon first the eggplant mixture and then the chicken thighs. Scatter remaining basil over all and spoon tapenade on a line in the middle of the chicken. Dot the rice with the cherry tomatoes. Drizzle with remaining 1T olive oil and squeeze lemon over all. Dust with salt and pepper. Serve warm, room temperature or cold within a day or two. If extra tapenade, serve with crackers on side. A tapenade story: Some years we give a Christmas wine and cheese party. One year, not long ago, we did this and I, at the last minute, added a huge bowl of this tapenade, surrounded by whole wheat crackers. It was the first thing to disappear, though a country pate was the most talked-about dish. You know how a lot of people “don’t like olives?” Those people weren’t there, I guess. Wine: Drink rose while you can. I like all kinds, but Tavel (French) is my current fave. Enjoy the cool wind coming as you eat this hearty, but healthy salad. Labor Day–wonderful three-day weekend with a myriad of possibilities. Walks, talks, cooking, a few put-off chores (deck painting) and some neighbors in for a meal or two. Also a day to babysit a golden retriever with an injured leg and her new pal, a Great Pyrenees named Rocket. Now Rocket is a new addition and is only 10 months old; he weighs about 100 pounds and thinks he can sit on your feet and lap. He also thinks our queen-sized bed belongs to him. Try to get one hundred pounds of anything off your bed. (Where else would he sleep? No where else is big enough.) So far, he’s as sweet and calm as the day is long, but he has one big problem. He doesn’t like closed doors. If a door is closed (like the one to the garage), he simply stands and whines and whines and whines… You get the idea. I think he misses his old family and may be contemplating and/or planning his escape; he definitely wants to be wherever Dave is and, right now, Dave is golfing. Can you hear this puppy crying? A newborn baby’s fussing cannot hold a candle to this galoof. —————-Why did you say this door was closed? No bed for me? The night was so pleasant, in fact, that we were able to spend a little time on the deck before it was too chilly. Lovely meal, but three of us couldn’t eat all of our chops; I sent Sara’s home with her and kept the rest of ours along with the cold roasted vegetables (new potatoes, zucchini, asparagus, onions, yellow peppers, flavored with rosemary, salt, pepper and olive oil). When I woke up this morning (100 pounds of white fluff jumping up–ready or not….) 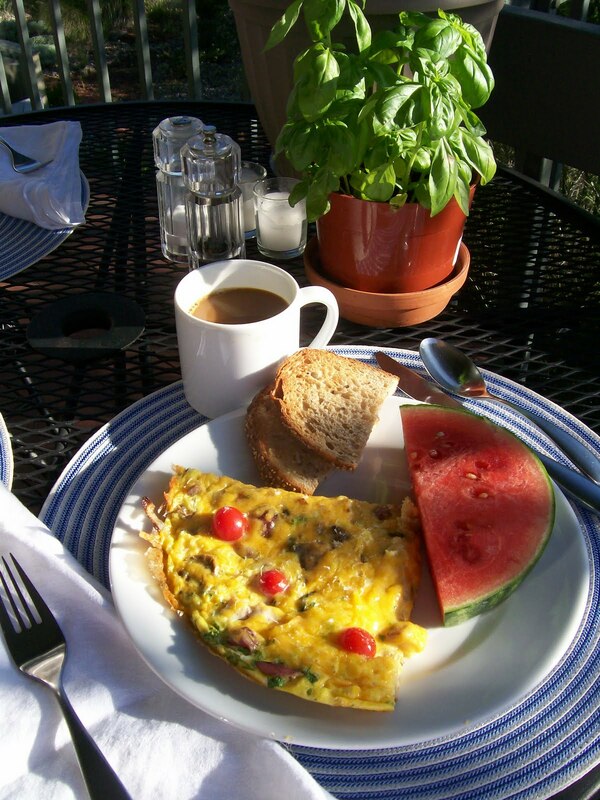 to the smell of Dave brewing coffee–heaven’s smell, I think–Dave had out on the stove a small omelette skillet and asked if I needed it for breakfast. I had not yet thought about breakfast, but gave the idea a whirl while I had my coffee. The little skillet wouldn’t do, because I just knew the leftovers from last night would make a super frittata that would feed us for breakfast, lunch and dinner if we wanted. Not only that, it would make a good addition to the September Staples blog–all about using things that are already in the house for meals. I grabbed the cold vegetables and pork chops out and gave them all bit of a hearty dice and set them aside. Adding a little butter to the pan, I sauteed 1/2 a small chopped onion, a clove or two of garlic and some fresh mushrooms. On top of that went the cold veg and pork and a slew of beaten eggs, parsley, some cheese (hoop cheddar–what was in the drawer) and a few extra tiny tomatoes for garnish, taste and color. Cooked a couple of minutes on the stove and popped into the oven for another five minutes or so- et voila, breakfast. Out of the oven, Dave showered on some parmesan. Preheat oven to 400 F. Set aside cold veg and meat. Heat over medium flame an ovenproof 12-14″ skillet with butter; add onion, garlic and mushrooms, sauteing until soft. Add cold veg and meat and warm through. Mix parsley into beaten eggs and season with salt and pepper. Pour egg mixture over meat and vegetable mixture and stir in half of the cheese of your choice. Sprinkle with the rest of that cheese and add the tomatoes. Let frittata cook until eggs are about half-way set and then place skillet in the oven for 5-10 minutes until cheese is lightly browned and eggs are set. Remove from oven and shower with parmesan. Cut into quarters and serve hot or cold, today or tomorrow. Sing a new song; make a new breakfast………..
Like some of you, I spend some time each month with BON APPETIT, GOURMET, FOOD AND WINE, etc. I actually have a terrible time letting go of old copies, kind of like some folks with their NATIONAL GEOGRAPHIC stash. As I straightened out my office yesterday, I found a stack of November and December cooking magazines from the last few years. No, they did not make it to Good Will. Hoarder. When holidays roll, I take them all out and look at them (and the current issues) to dream of menu possibilities and fill a basket in the living room with the bounty of years’ worth of Thanksgiving and Christmas recipes. Well, this month’s BON APPETIT is jam-packed full of great ideas. Pick it up if you don’t have a subscription. Somewhere in that issue, there is reference to making meals for a week (or two) out of what’s in the pantry and the frig… at least mostly. Giving the grocery and your bank account a rest. Cleaning out the shelves. At this time of year, I am all over that; I’m ready to clear out my garage pantry to make sure last year’s candied fruit doesn’t go in this year’s fruit cake and to pitch last year’s pintos in favor of the fresh ones ready soon at Rocky Ford. It’s also a good time to fill up a bag or two for the local food pantry, whose shelves are full come Thanksgiving and Christmas, but often suffers from shortages as school starts. You won’t use four jars of jelly before the expiration date, but someone else might. I’ve been home from San Francisco and the Bay Area (also Napa) for a couple of days, but those have been taken up with a sick puppy, who somehow tore a huge gash in her leg playing ball outdoors. (Gab is recovering nicely, thanks.) Anyway, the grocery store and I have not yet met this week and I’m reduced to delivery or something from the pantry. Favorite delivery place did not answer (help!!! ), so it definitely was the pantry. Canned pumpkin and Progresso soup aside, the canned clams and Cento tomatoes immediately caught my eye as I poured over the pics from the trip. There were soft, rambunctious, outrageous, flamboyant and creative wines everywhere we went, but Fisher was the standout. I may have fallen just a little bit in love with the owner, that might have done it. (Just talk wine, honey!) More on the wine another post; it won’t arrive at home for a while (until the weather cools.) Many loving thanks to friend, Rick, who picked places we visited. What a job he did! What wine is on the way! Some for now; some for later; one special bottle for a friend whose wife is about to have a baby. The idea is to save it for the child’s 21st birthday; it could happen. Sunday, we had an over the top visit with family and spent a soft, breezy afternoon in their back yard….Bay area..the backyard was the family room! Cooked, visited, played catch, drank some Napa Chardonnay, did it all again. Set to boil 6qts water in 8-10qt stock pot. Add 1t Kosher salt, a few grinds of freshly-ground black pepper and a sprig of fresh sage, if you have it. Cook pasta as per directions on package and keep warm. Meantime, heat to medium heat a 12-14″ saute pan and add 2T olive oil. Stir in onions, garlic, leeks, celery, carrot, sage and red pepper flakes. Cook until onions are tender. Add white wine and tomatoes, breaking up tomatoes. Cook five to ten minutes, stirring often. Lower heat and add clams. Heat through. With tongs, place pasta in each bowl and top with sauce. Garnish with cheese. Pantry notes: I happened to have the fresh vegetables in the recipe, but you surely could make this sauce with less of the fresh. For instance, if you had onions only and dried sage, the sauce would still be good. Even just garlic would work…just something to flavor those tomatoes. I buy Cento tomatoes in large quantities and always have dry pasta and arborio rice for risotto as well. My frig pantry is seldom without Parmesan or Pecorino Romano (less expensive, different flavor) because they are such stand-out flavor boosters. I also keep a small jar of minced garlic in case I’m out of fresh or the fresh has sprouted those tiny green shoots. Fast and furious; fun and famous…………. Make clam sauce soon. It’s done before the pasta. Light, filling, nutritious..